In the previous chapter we went through the creation of a Pure PHP extension that takes up the full content area when rendered. But you can also add an extension to a content page within the page editor. We call this a page extension. This is both possible using an ordinary Sitemagic CMS extension, and a Pure PHP Extension. 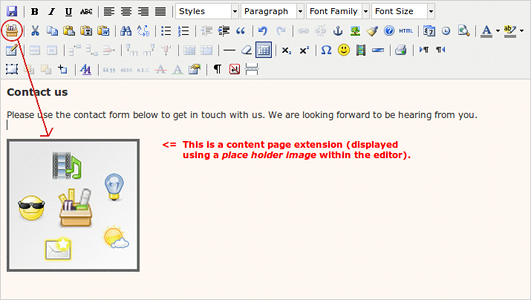 The image below demonstrates how a page extension is added and displayed within the page editor. In this case we have added a contact form to our page. Browse to extensions/SMPurePhp and create a file named HelloWorld.pageextension.php. The file must have the .pageextension.php suffix. To integrate it with Sitemagic CMS, simply use the $cfg configuration array as shown below. // Extensions are displayed using a place holder image in the page editor. // Specify its width and height in pixels below (without a 'px' suffix!). // This file is executed multiple times during different stages of the life cycle. // redeclared. As these are now declared runtime, they cannot be called before declaration. // Simply print/echo the code you wish to display within the content page. Now open a content page for editing, click the extension button on the toolbar as shown on the image above, and add your new page extension to test it.